The castle of Hadleigh was built on the edge of the hilly lands in the S. of the county, where they sink into the marshes bordering the N. side of the Thames, almost opposite to the Isle of Sheppey. It occupied the entire summit of a somewhat lofty hill at the head of a small valley, having a picturesque and magnificent prospect over the Thames into Kent, and away to the Isle of Thanet and the woodlands, with a view far and wide over the German Ocean and the low-lying lands of Essex in the E.: a good position for security and defence. Hubert de Burgh, the faithful adherent of King John, who became Earl of Kent and Justiciary of England, obtained, in 1231 (15 Henry III. ), a licence to fortify and crenellate, and as the execution of the work usually followed immediately after the grant, it may be assumed that this is the date of the erection by him of the castle. Little is known of the history of this once noble structure. After the disgrace of Hubert de Burgh it was seized by the Crown and became in turn the possession of various persons. In 1268 Robert de Thaney was its custodian, and in 1299 Edward II. consigned the castle and park of Hadleigh to the Queen Margaret. There is a notice in 1327 of a Geoffry Pertico as formerly lord of the castle and village, and nothing further appears about it till the year 1400, when Aubrey de Vere, Earl of Oxford (see HEDINGHAM), died seised of the castle and its appurtenances, including a water mill, granted to him for life by Richard II., with reversion to the Crown. In 1405, Humphrey, Duke of Gloucester, possessed the castle, and caused it to be well stored with military equipments. In 1452, Henry VI. granted castle and manor to his brother, Edmund of Hadham Earl of Richmond, and they remained attached to the Crown until Henry VIII, gave them to his forsaken Queen, Anne of Cleves, for her maintenance. In 1552, Edward VI. granted them to Lord Riche and his heirs, from whom they have passed in regular descent to the families of St. John and Bernard. The plan of this fortress differs greatly from the usual Norman design, inasmuch as there seems to have been no massive keep belonging to it. The trace of the enceinte followed the contours of the top of the hill, and forms an oval, enclosing an area under two acres in extent. The whole seems to have been built of Kentish rag. On the N.W. and E. sides the castle was defended by a deep ditch, and at the N.E. and S.E. corners are the ruinous remains of two lofty towers ; the first of these is very nearly demolished, but the other is sufficiently perfect to show the construction of the rooms; both were circular outwardly and hexagonal within, and were about Go feet in height. The outer walls are 4 to 6 feet thick, and are well strengthened with buttresses. Along the S.W. front and up to that corner are remains of the offices and apartments in very strong masonry, having probably a rampart and battlements along the top, as at this part there were no flanking towers ; there are also marks inside of the usual half-timbered buildings against the wall, and in the course of this wall there was a semicircular tower with dungeons underneath. 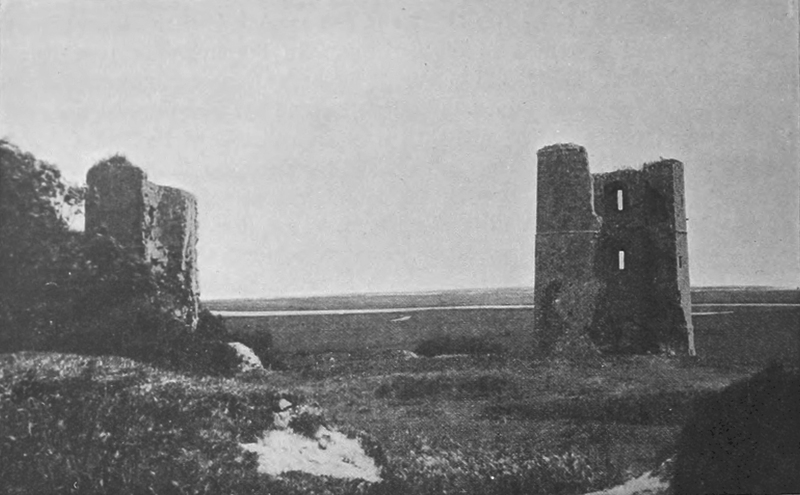 The entrance was on the N. side, where was a large circular tower defending the gate, now quite vanished, which acted possibly as the keep ; there was also a circular flanking tower on the N. front. Among the reports of the Essex Archaeological Society, vol. ii., is a drawing showing the present ruins, and one is given also by Buck. It is not known when the castle was dismantled, but it was in ruins in the time of Camden, who wrote in 1593; it may have been destroyed, as many other castles were, after Edmund of Hadham’s death in 1456.